It’s time to start painting the trim. First up: finishing the kitchen. Hi Nicole! Looks like a fun project! I’m just wondering, what kind of precautions do you take to paint while you are pregnant? 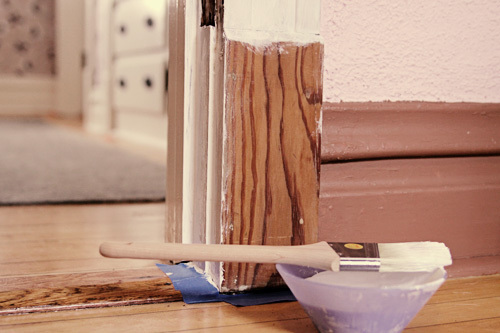 Do you use a low-VOC paint, what about primer!? Looking for some advice so I can keep busy at my house during my pregnancy! Thanks! I can’t wait to see how your trim turns out! Already looking lighter and brighter! Awesome! It’s gonna look great! My ghostbusters tee is a harvard sleep T! Eager to see the results! By the way, you’ve gotta try Frog Tape instead of the dreaded blue masking tape. It’s gonna look great, Nicole. So bright, fresh and clean! YAY! Hi Nicole, I have found your blog so much an inspiration that I’ve decided to tackle our ugly kitchen and paint the wood cabinets white. However I wanted to ask, how much do you need to sand the cabinets before painting? Any ideas on how you get an even coat etc? I know you did a paint tutorial for painting a room (which I’m tackling next!) but it would be SO helpful if you did a similar one for the cabinets and trim. Good luck! We are priming and painting our big remodel project this weekend. I just re-read your painting guide from a while back to refresh my memory…here we go! 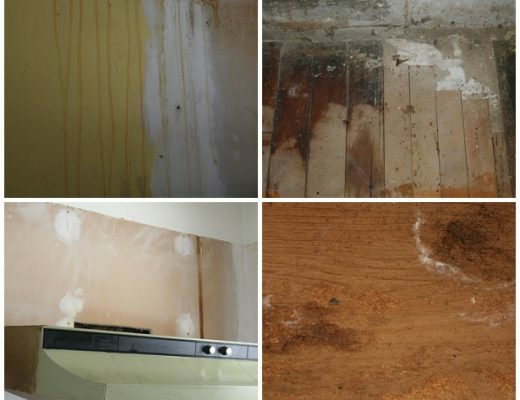 There are plenty of non-voc primers and paints out there. lowe’s has a well-priced non-voc collection…(primer included). ps i agree with the above…it looks brighter already! I bet it’s gonna look great. This is the weekend for home projects. I painted all the trim in my house too and never looked back! Good for you for doing what will make you happy:) I still get people telling me what a shame it is that I painted. I tell them it is a good thing they don’t live there! Ghostbusters Video Game t-shirt?? That’s super cool! Ha ha! What is it about pregnancy and painting? I painted every room in my home over the course of my pregnancy – I was spurred on by the fact that every color in my house (painted in a literal rainbow of hues by the previous owners) made me feel ill when I had morning sickness. And I seem to remember certain photos of you painting your front porch while very pregnant with Eleanor. Good luck, Mama! You’re putting me to shame! I’ve been in the process of painting the trim in our house for two years now!! YAY, can’t wait to see how it turns out but already looking so much better. I’ll be doing mine some time in the near future. woo hoo. Hope the painting was successful! I thought it was so funny about the trim… I’d paint it too! That’s the joy of it being yours- you can do whatever you want! Hugs from Copenhagen! We’re working on parallel projects! We moved into our current house when I was 12 weeks pregnant, and I’m now at 25.5 weeks. It’s been slow going, but I’m painting all the wood trim in our house (and every room too). I got to banish the off-white walls and tacky platicy-oak trim. The pressure is on though- it is getting harder and harder to work while sitting on the floor. can’t wait to see the finished project, especially since we are in a similar dilemma. Good luck painting it up! Your counter tops and back splash are gorgeous. 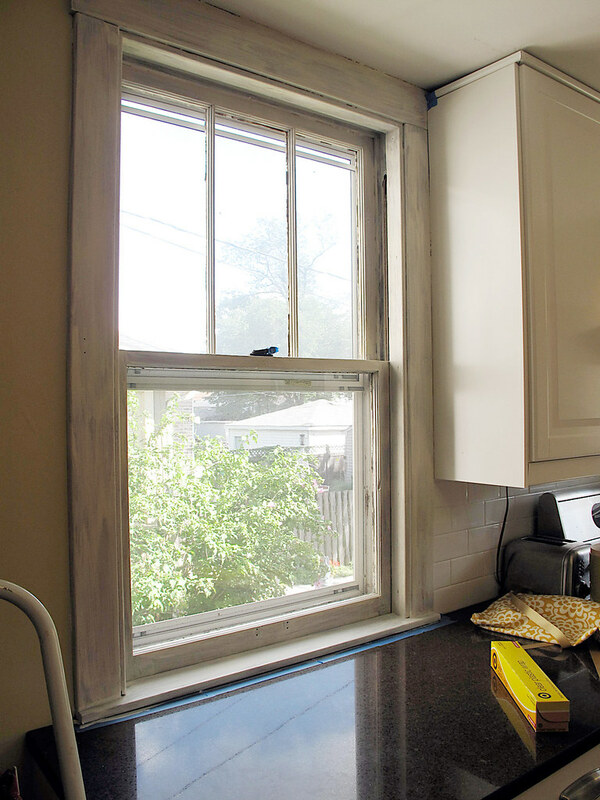 A nice little touch up of the window frame seems just what your kitchen needs.